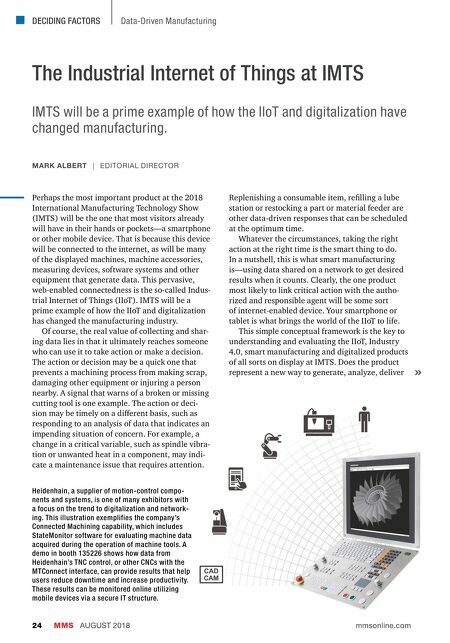 DECIDING FACTORS MMS AUGUST 2018 24 mmsonline.com Data-Driven Manufacturing The Industrial Internet of Things at IMTS IMTS will be a prime example of how the IIoT and digitalization have changed manufacturing. MARK ALBERT | EDITORIAL DIRECTOR Perhaps the most important product at the 2018 International Manufacturing Technology Show (IMTS) will be the one that most visitors already will have in their hands or pockets—a smartphone or other mobile device. That is because this device will be connected to the internet, as will be many of the displayed machines, machine accessories, measuring devices, software systems and other equipment that generate data. This pervasive, web-enabled connectedness is the so-called Indus- trial Internet of Things (IIoT). IMTS will be a prime example of how the IIoT and digitalization has changed the manufacturing industry. Of course, the real value of collecting and shar- ing data lies in that it ultimately reaches someone who can use it to take action or make a decision. The action or decision may be a quick one that prevents a machining process from making scrap, damaging other equipment or injuring a person nearby. A signal that warns of a broken or missing cutting tool is one example. The action or deci- sion may be timely on a different basis, such as responding to an analysis of data that indicates an impending situation of concern. For example, a change in a critical variable, such as spindle vibra- tion or unwanted heat in a component, may indi- cate a maintenance issue that requires attention. Replenishing a consumable item, refilling a lube station or restocking a part or material feeder are other data-driven responses that can be scheduled at the optimum time. Whatever the circumstances, taking the right action at the right time is the smart thing to do. In a nutshell, this is what smart manufacturing is—using data shared on a network to get desired results when it counts. Clearly, the one product most likely to link critical action with the autho- rized and responsible agent will be some sort of internet-enabled device. Your smartphone or tablet is what brings the world of the IIoT to life. This simple conceptual framework is the key to understanding and evaluating the IIoT, Industry 4.0, smart manufacturing and digitalized products of all sorts on display at IMTS. Does the product represent a new way to generate, analyze, deliver Heidenhain, a supplier of motion-control compo- nents and systems, is one of many exhibitors with a focus on the trend to digitalization and network- ing. This illustration exemplifies the company's Connected Machining capability, which includes StateMonitor software for evaluating machine data acquired during the operation of machine tools. 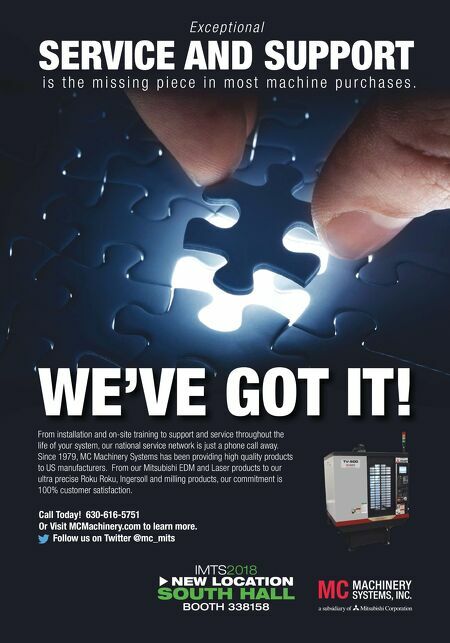 A demo in booth 135226 shows how data from Heidenhain's TNC control, or other CNCs with the MTConnect interface, can provide results that help users reduce downtime and increase productivity. These results can be monitored online utilizing mobile devices via a secure IT structure.